Almost every day, national museum room filled with visitors, mostly school children, as well as local and foreign visitors. In addition to being a business center, this place is also a city that kept many historical stories since the Dutch colonized Indonesia to struggle for independence. One of the tourist centers of education and history that can be visited is a monument and museum at the National Monument or Monas called. Visitors can obtain much information about the history and development Monas by paying Rp 2,500 for adults and Rp 1,000 for children or students. Meanwhile, visitors who want to rise to the top court's independence and the fire must buy another ticket Rp 7,500. 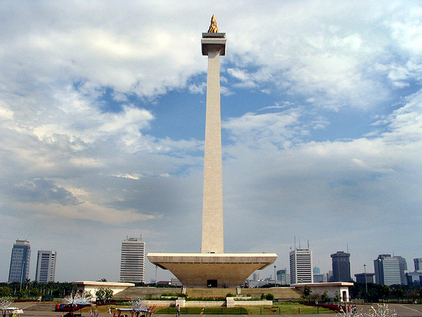 Monument was established on August 17, 1961, during the reign of Indonesia's first president, Sukarno. This monument was built with the hope of the people of Indonesia will always remember and preserve the Indonesian struggle for independence during the revolution of 1945, and continues to inspire patriotism and spirit of the present and future generations. 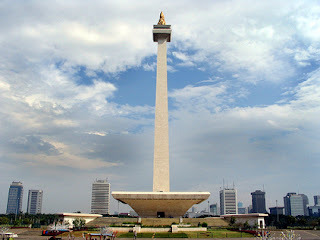 In the Monas monument, there are some places that can be visited. There is a Museum of National History, the space of freedom, the court of the peak and the fire of independence, as well as relief history of Indonesia, located on the outside of the monument. Indonesia's National History Museum located on the ground floor of the monument. The room is very spacious, with a box-shaped area of ​​80m x 80m. Here, visitors can see the 51 dioramas featuring the history of Indonesia; start the prehistoric period, the ancient empires like Srivijaya and Majapahit, the European colonial period, followed by the pre-independence against VOC and Dutch East Indies government. Diorama continue until the beginning of the Indonesian nationalist movement of the 20th century, the Japanese occupation, the war of independence and the revolutionary period, until the New Order period in the reign of Suharto. Visitors can also view a collection of black and white photos, which were displayed on some pole in space. Another historic place is a space of freedom, which is on the monument in the cup. This room is a symbol of statehood and independence save Indonesia, including the original manuscript of the Proclamation of August 17, 1945 that are stored in a glass box in the gilded gates, the emblem of the Indonesian state, map of the islands of the Republic of Indonesia plated gold, red and white flag, and the walls are inscribed the manuscript Proclamation of Independence of the Republic of Indonesia. Independence chamber is used as a space for silence, to commemorate the struggle of our national heroes.